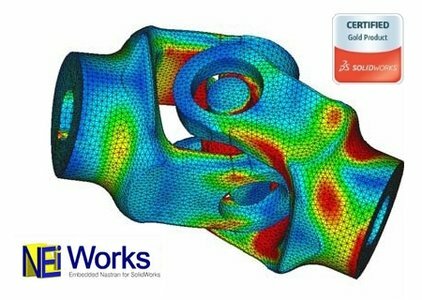 NEi Software, a world leader in CAE innovation, presents NeiWorks 2.1 SP1.0, which one provides SolidWorks users with an embedded finite element modeling tool. It features the familiar SolidWorks look and feel for all menus and functions, providing seamless integration between design and analysis. NEi Works features true geometry associativity, which means your loads, boundary conditions and even meshes are updated interactively whenever changes are made in SolidWorks. NEi Works Basic gives product development professionals the most widely used and needed analysis capabilities - linear statics, steady state heat transfer, normal modes, buckling and prestress, plus additional capabilities for handling composite material analysis, performing optimization analysis, and modeling assemblies with contact. See how NEi Works can bring engineering insight to your design process and help you spot problem areas, optimize performance, and virtually test before building expensive prototypes and fixtures. In short, save time and money while building more innovative, higher quality products. NEi Software is a world leader in CAE innovation supplying Nastran Finite Element Analysis (FEA), engineering simulation, and virtual testing software solutions for 20 Years. Engineers gain insight with digital prototypes, images, contour plots, graphs, and animations of linear and nonlinear structural stress, composites, deformation, dynamics, vibration, kinematics, impact, heat transfer and fluid dynamic (CFD) simulations.